I'm trying to "set" my pedalboard order, but my biggest concern has been working around buffers and my Fuzz pedal. I also struggle a bit, because I want to use my amp's distortion, but I assume I'm out of luck with using that in conjunction with the looper pedal, because even with the 4-cable method, the distortion wouldn't come back through...would it? I actually currently only own 3 cables that work, so I don't have an easy way to test this. All using just the two cable method. From guitar to tuner, and out the looper to the amp. I also have a JHS Little Black Buffer which I bought, not realizing the tuner already had one, so it may or may not be overkill...I'd take any advice on that as well! From what I understand you definitely should put some fuzz pedals before any buffers, including ones like in that tuner. I think there are some newer fuzzes that work fine with buffers, though. Try it after as well, though. You may like how it sounds. You never know. I have never actually used a fuzz so all I have to go on for how they sound is YouTube videos, and some of them sound really cool, but I'm not sure how I will like the sound of a muff-style or fuzzface-style fuzz if I've been using distortion and overdrive and nothing else. I'm wondering how weird it will sound to me. Basically, they recommend putting the fuzz pedal first: "If you are a fuzz lover, just place the buffer directly after your fuzz box, and this will work great." Also: " If you have all True Bypass pedals, then you should use two buffers. This will give you the best signal strength and clarity possible." So, try placing the fuzz directly after the guitar, even before your tuner (which you say has a buffer). Then your other buffer all the way at the end of your signal chain, as the last pedal. I tried some experimentation after spending way too much time in the sun on Saturday. Without any A/B/Y pedals, I kept switching cables around and completely lost track of what was what, and which was which. spudmunkey wrote: I tried some experimentation after spending way too much time in the sun on Saturday. Without any A/B/Y pedals, I kept switching cables around and completely lost track of what was what, and which was which. You've invented the scatter-wound pedal board. I just recently got that Xotic SP Compressor pedal and I really like it! I originally planned on putting it on a board for my acoustic guitar, but I liked it so much that I'm using it on the board I use with my electric guitars instead. 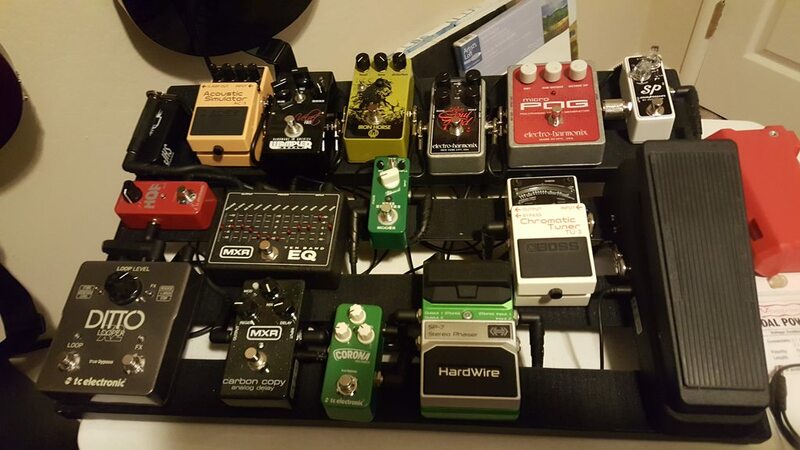 Thanks to that pedal (and several other mini pedals) I was able to squeeze 10 pedals onto a PedalTrain Jr. board, including my TimeLine. All my favorite pedals are on a board I can easily grab and take with me, and they're run off of one power supply. That's exactly what I wanted. The SP Compressor replaced my Barber Tone Press, which is a fine compressor, but too big to fit that board, so instead it got put on my acoustic guitar board. 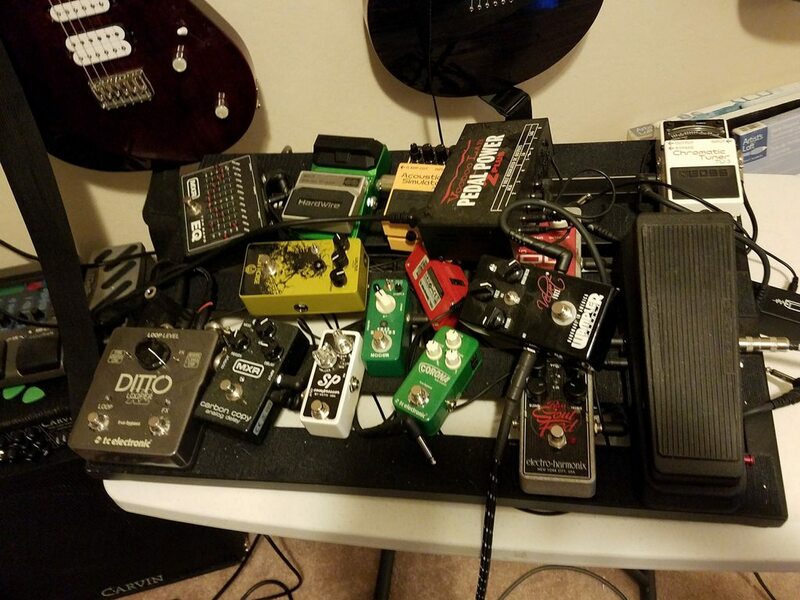 That pile of pedals thing you've got going is interesting, though. I might try that. I wonder if my Mini HOF will sound better lying on its side like yours? The Hall of Fame mini will only sound as good as mine, if you also unplug yours... Like mine is. I actually bought this as my very first compressor. After nearly 30 years, I never had one. After reading a bunch of reviews, and listening to demos, this is the one I ended up with. While there were others that I thought sounded better, they were all much more expensive, or were a full size pedal... Something I wasn't willing to trade away for my pedalboard, because I knew I wanted to fit some more things on it. Speaking of size, I am also comparing the new mini POG to the micro POG that I have. Unintuitively, the mini is smaller than the micro, and would actually allow me to fit one more pedal I believe. I'm not sure what that one more pedal would be, but it would be nice to know I could fit one more. Perhaps a tremolo, a rotary speaker Sim pedal, or maybe one more gain pedal of a specific type of distortion tone I have in my head. ...but because the MXR 10-band EQ pedal is 18v, I had to bridge two outputs on one of the power supplies (two Voodoo Labs Pedal Power 2 Plus units), so I'm one short. Took the buffer out of the signal chain for now, and it's absence is noticed. I have a Fat Fuzz Factory, and the darn thing not only gets temperamental with a buffer in front, but needs the pickup volume knob (passive, of course, as active is basically a buffer circuit), all the way up. Turning down the volume, and it gets weird, but that is very much the nature of that pedal. What I'd do (and have done) is use an ABY pedal to flip/flop between a buffer input, and the fuzz input as the start of your chain, or just buy/build a simple bypass pedal. This won't work if you use a belt-pack style buffer. A large pedal switcher pedal may also be beneficial to take pedals in and out of your overall circuit, before it hits the amp. Some people like a straight-to-the-amp sound (I know I do), and this type of setup can also afford that. They're relatively cheap, especially used, but you really don't need to spend much on 'em since the parts are super cheap. I built one years ago that's a dual ABY switcher in one MXR sized pedal, using 3PDT switches. I think it cost me $10 to build (the switches) and I basically had found a junked headset splitter box with plenty of jacks in it (8 of 'em). Some midnight blue metallic paint later, and it looks much better. As for your 18V woes, I have a solution for that, too. I run one of my guitars (has EMGs) internally at 18V, from a 9V battery. How? DC-DC boost converter. You can get one for a couple bucks online, an adapter cable, and then you just need the soldering skills to build it. Efficiency is good (around 92%), and I've noticed no noise issues with EMG pickups. Curiously, I *did* try one of these boost converters out with the KFK version of the MXR 10 band EQ. What I found is that it runs fine at 18v and (by mistake), if you reverse the polarity of the power supply going to that pedal, it runs....from a 0 and -9v setup. The lights on the pedal run dimly, but the sound doesn't seem to change, though output is lower. Anyway, I can build you one for cheap, and it would allow you to run the pedal off a 9V supply. Keep in mind that the current draw will go up by 108%, due to the doubling of volts, plus that 8% inefficiency of the boost converter. It roughly halves the time on a 9V battery, but with an actual power supply, it won't matter. Listed current draw for the 10 band pedal is 26 ma, so ratchet that up to around 54 ma current draw, which still should be just fine on a single output from your PSU in 9V mode (they're rated for 100 ma).